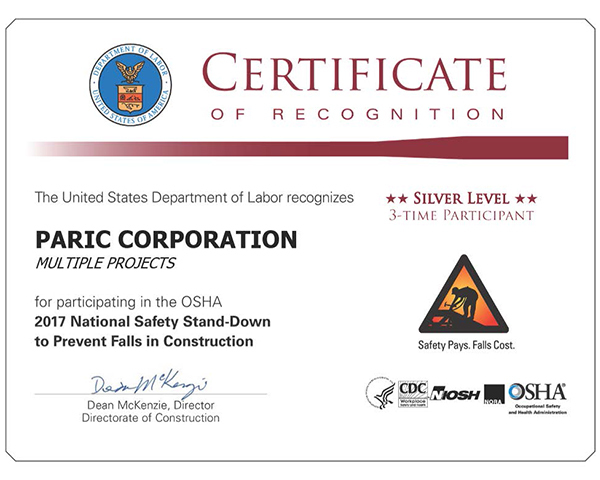 PARIC received a Silver Level Certificate for National Safety from the United States Department of Labor for participating in the 2017 National Safety Stand-Down week to prevent falls in construction. The National Fall Prevention Stand-Down raises fall hazard awareness across the country in an effort to stop fall fatalities and injuries. A Safety Stand-Down is a voluntary event for employers to talk directly to employees about safety. Safety is PARIC’s number one goal year round, showing that, PARIC hosted over 10 Safety Stand Downs with over 570 people participating. Stand Downs were held at Webster ISB, Fenton Logistics, Federated Rural Electric Insurance Exchange, John Knox Village, Kingswood Senior Living, Jackson Electric Cooperative, BJC West County, and Midwest Energy Electric Cooperative. At each location, people took the time to be reminded of safety procedures and emphasize the needs for safety on each job site every day. To learn more about the National Safety Stand-Down Week visit osha.gov.